"Coming up at the top of the hour: the dolphins talk." The sound came from the largest of the four television sets in Robert Mornay's home. His wife, Ingrid, walking into the room with a tray, looked over at the set as she placed some sandwiches in front of her two teenagers. "How soon before Robert comes on?" she asked. "Just a few minutes, Mom," Denny said between gulps. "Better sit down now." "I'll be right back. My abelskivers should be ready in the oven." Abelskivers were a favorite of Ingrid's Danish grandmother Hulga, those tiny succulent balls of pastry, blueberries bursting with flavor inside. Robert and the kids loved them, and Ingrid was planning to set some aside for her husband when he returned from the ICN broadcast late tonight. As she fondly recalled Grandmother Hulga's kitchen, Ingrid remembered the story her uncle told her about how she got her name. Her parents wanted to follow an old family tradition and name her by combining their two mothers' name, Astrid and Hulga, into one name. The name came out 'As-Hul' so they quickly decided against that combination and chose their fathers' name, Ingmar and Siegfried, to come up with Ingrid. As a child she loved to wander in her Grandmother Hulga's kitchen when she was baking. Hulga allowed Ingrid to fill the abelskiver pans with balls of dough and place them into the oven. The smell of abelskivers baking always took her back to Grandmother Hulga's kitchen and six years old. She mused wistfully that she never got to bake abelskivers for her first husband. She was only sixteen years old when she ran away from home one night and eloped with a boy that her parents had forbidden her to date. When she returned home with her new husband, her father escorted her to her room, sent the groom away, and called his lawyer to annul the marriage. She returned to high school and graduated. Her parents wanted her to go to college to study business, but she enrolled in dancing instead, much to their chagrin. After a year in college, she met Paul Royce, a young aeronautics engineer with a bright future. This time her parents approved of her selection and began plans for the biggest wedding ever in Indianapolis. Ingrid's mother made all the decisions for the wedding, selecting the wedding dress, the bridesmaids' dresses, the reception hall, the entertainment, everything except for the wedding cake, which she allowed Ingrid to choose. Of course her mother recommended the bakery. Ingrid chose a traditional white tower of icing with plastic bride and groom on the top. For the inside of the cake, Ingrid specified devil's food with raspberry filling. For the almost twenty years since her wedding, Ingrid chuckled with delight whenever she recalled the old maid aunt's gasps when she and Paul cut the wedding cake at the reception. Many years later when she and Robert began planning their wedding for October 31st, her mother was gone and she made all the decisions. Since it was a second wedding for him and a third one for her, she selected a non-traditional wedding dress, an ankle length green dress with flowers embroidered around the scoop neck. The cake was a single-layer, almond-flavored, rectangular cake in Halloween colors with stuffed scarecrow dolls for the bride and groom. No devil's food cake this time. She recalled the wedding ceremony at the Swedenborgian church, Wayfarer's Chapel, the sound of the waterfall in the rear of the all-glass church and the sight of the trees on the outside of the walls waving in the afternoon breeze. She savored the moment when they reached the outside of the chapel after the service. As the rice sprayed over their heads, Robert pointed to the Pacific Ocean where, on the horizon, the island of Catalina had risen through the mists. In the many years they have been in California since, she had never again seen the island from the shore. It was a good omen and raised their already high spirits for their honeymoon to Hawaii. Motoring away from the chapel in their 1951 MG TD, Robert turned on the Spartan air horn which played the highly recognizable melody from John Philip Sousa's Stars and Stripes march. Her father had long ago given her the horn from his 1927 Pierce Arrow, but Paul had never cared to install it. That was the difference between Robert and Paul, she thought as she took the abelskiver pan from the hot oven. Paul loved the familiar and Robert loved the different. She chuckled to herself when she remembered the night Robert bought the TD. They had been poring over newspaper ads for weeks and decided to look at cars finally. Earlier that day they had seen an average looking TD for sale for $1000. That night they met an unemployed social worker who was living in a groundskeeper's cottage on an estate overlooking Griffith Park. He was baking organic bread to eke out a living and had spent the past eight years restoring his TD to mint condition. It had nine coats of a deep blue Chinese lacquer that you could get lost in if you stared at it, Pirelli radials, overhauled engine, re-chromed accessories, and new calfskin upholstery. It was picture perfect. As they walked behind the owner returning from the garage, she watched Robert remove two hundred dollar bills and a fifty and place them in his front jeans pocket. That left only $1400 of the asking price of $1650. Later around the table, the car owner said he had someone coming to pay $1650 on Monday. Robert told him we wanted the car and opened his wallet wide so all could see its contents, removed all the bills from it and proceeded to count them out on the table, one at a time, allowing the starving bread baker's eyes to follow each bill in its trajectory to the top of the pile of bills. " . . . twelve . . . thirteen . . . fourteen. There! That's all I have." Time stood still. Nobody spoke. The car owner hung suspended in time and space, balancing TD and fourteen one hundred dollar bills. Slowly he moved his hand across the table and retrieved the bills and the sale was done. Dumping the abelskivers from the baking pan, Ingrid remembered the drive home that night. All she saw was that Robert seemed to weave from one side to the other of the slow lane of the Hollywood Freeway as she followed behind him. When they got home Robert explained that he had been driving a loosey-goosey '64 Chevy Bel Air for several years and his hands involuntarily moved the steering wheel from side to side, which in the TD with its rack and pinion steering and tight turning radius caused him to weave all over the freeway. "The only way I could keep my new car in a straight line was to let go of her." She smiled when he said that because it was her fondest hope that her new husband would treat her as well as he did his new car, after adjusting to the new handling conditions. "Mom, Robert's on the tube," Denny called from the other room and she hurried into the screening room with the steaming abelskivers. Three television sets were tuned to local stations and the fourth and largest TV carried the International Cable Network news station. ICN was broadcasting the dolphin interview live all around the world, and had already estimated the viewing audience to be ten times larger than any other live broadcast in the history of television. The broadcast was going to be seen in remote locations that had never seen a television before. In the far reaches of the Outback of Australia, in the deepest jungles of Borneo, in the rain forests of the Amazon, portable TV sets with small eleven inch satellite dishes had been shipped and set up by ICN crews. ICN had determined to make this the media event of the century. Camera crews accompanied the portable TV's to record the reactions of the far flung audience. "Look, Wendy," Ingrid pointed to one of the smaller TV's, "there's Robert on camera. Turn on the volume to that set." Wendy knew all the remotes better than Ingrid and Denny and quickly switched the sound off on the ICN set and onto the local Miami station's news coverage. Her stepfather Robert Mornay was a celebrity in Miami and the video was file footage of an earlier tour of the Inter-Species Communications Lab. The family had all seen this clip many times before, but even so they were disappointed by seeing Mornay's lips moving and hearing the local announcer's voice narrating the scene while filling time in preparation for the ICN global feed. Soon the station cut to the taped interview sound. "Dr. Mornay, this broadcast will be viewed in every country in the world. Tell our viewers how it will be possible for each person watching to hear the dolphins speaking in their own language." "Dolphins speak pictures, actually newsreels, if you will, and that is a universal language. They use their vocal apparatus to mimic sounds that they have heard from scenes they have seen. At ISC we designed and built an apparatus we call PHIZZNETtm to enable humans to see like dolphins, and another device we call SPIZZNETtm to enable humans to speak like dolphins. In the last stage of the SPIZZNETtm design we developed a way to convert English sentences into the dolphin's visual language. Think of it as saying 'See Spot run' and creating a visual scene of the dog Spot running in the yard and having that scene surround your listeners. By inverting this process we were finally able to convert dolphin speech into English sentences. There are still some imperfections in the computer translation process so, for this broadcast, we will use a trained human reading the dolphin speech aloud. The effect will be much like a commentator on a live news broadcast explaining what the images you are viewing means." "The dolphins will speak in English?" 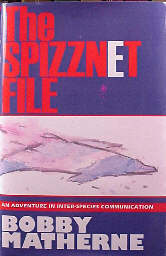 "Yes, only because we used our native language for the design of our SPIZZNETtm. For this worldwide broadcast ICN is providing simultaneous translation into 131 different languages so that virtually every person on earth will be able to hear the dolphins speak in their native language." "Dr. Mornay, this broadcast has been hyped for months now. Why has it taken so long before the average person could have a chance to hear a dolphin speak?" "There was a condition set down by the Dolphin People themselves, not by the ISC project team nor by the ICN news people. The dolphins specified early in the project that they wished to talk to the entire Human People, as they call us." "You say, 'they.' Will there be more than one dolphin speaking during the broadcast?" "I'm glad you asked that question. The dolphins will be speaking as a group, but one at a time. We humans would tend to elect one spokesman to do the talking for the entire group and trust that person to convey all the thoughts of the group. The dolphins have a different approach; they form a 'super person' when they speak in a group. When they speak, only one dolphin will have the most powerful idea at one time. The other dolphins will sense that and allow that dolphin to speak while the other dolphins concentrate intensely on the speaking dolphin. They tell us that they found out long ago that this concentration helps the speaker to think clearly and speak as well as it can. When each dolphin finishes its point, some other dolphin will begin speaking." "This sounds like it might be confusing to the television audience." "Yes, it might be, so the dolphins have adopted the practice of speaking in the first person plural when talking to us. Thus you will be hearing the phrase "we Dolphin People" many times during the interview. When they speak this way we do not know which dolphin is speaking at any one time, only that the 'Dolphin People' are speaking to us in one voice. That voice will be describing events that have happened thousands and millions of years ago as it creates visual images in full color of these events. The viewers of the broadcast will truly be eye witnesses to history." Suddenly all four television sets began showing the same picture. "Mom, I think it's starting." Ingrid rushed back in, dumped the last batch of abelskivers into the bowl, and sat next to Wendy on the couch as the live dolphin broadcast began from the ISC Laboratory. She thought back to the last global broadcast that she had watched with Robert before they were married. It was his birthday and Robert and Edith had come over to watch the first man set foot on the moon with her and Paul. She chuckled as she recalled her cosmic joke: for snacks, she had designed a green cheese ball. With craters and a small American flag on a toothpick stuck into the top, it was a miniature of the moon. "When we started eating the cheese ball, we didn't know for sure if the moon was really made of green cheese, but before we had finished eating it, we knew for sure it wasn't. Cheese balls and abelskivers -- cold cheese and warm succulents -- quite a change." she thought, wishing Robert were next to her for this broadcast, too. "Would you tell us about the earliest memories of the Dolphin People?" With these words the ICN broadcast began. Ingrid held her breath as the screen dissolved into the strangest image she'd ever seen. It was like watching an old hand-tinted black and white movie through a thin sheet of fluorescent gelatin. On the screen were images of human beings millions of years old walking on a beach. As she watched, their arms and legs slowly metamorphosed into fins. All around the world people held their breath as the dolphins began to speak. In the beginning we Dolphin People resembled the Human People. We walked on two legs and had arms with hands on the end of them. We manipulated the world with these hands, but always growing in our knowledge of what it meant to be a person. When we reached our understanding that everything is already perfect as it is, we no longer needed hands anymore. The Human People try, with their hands, to create machines to perfect their world because they have not discovered that their world is perfect as it is, up until now. Not all of us reached that realization at the same time. First individuals, then isolated groups of Dolphin People gathered into tribes all across the Monocontinent. Wherever we lived, we were persecuted by the non-Dolphin clans and driven from our lands to the very edge of the Great Sea. When a critical mass of believers was reached, a huge ululation of joy vibrated across the continent, and we Dolphin People, as a single joyous body moved to the seashore, entered the water of the Great Spirit and lived thenceforth in the water in peace, love, and joy. We Dolphin People found life by the sea to our liking. The sea provided us with abundant food, shelter, and living space. Over eons our bodies changed back to that of the sea creatures we originally were before we first walked on the land of the Monocontinent. Only this time, we retained our air-breathing lungs and developed our breathing time underwater, increasing it until we reached the thirty plus minutes we have today. Our skin became smooth, and our body shapes were streamlined and warmed by a layer of blubber covering our exterior skeleton. A large bubble of blubber formed to protect our head from collisions. Our ears, eyes, and vocal cords all became rather useless to us. Since we lived in the water most of the time, there were few sounds of importance underwater, and our eyes were useless at night and in deep or murky water. Gradually our vocal cords were replaced by a primitive phonation apparatus that allowed us to locate objects in murky water. With our eyes being used less and less, the portion of the neocortex of our brains formerly devoted to optical data processing was re-allocated to auditory data processing. We became better and better at hearing and poorer at seeing, until at one point a crossover of function occurred: We, the Dolphin People began to see using our ears. This development was soon followed by our ability to speak pictures, using a visual language we created. With these new abilities, we were able to leave our seaside homes and move into the sea permanently. We had been sea animals, then land animals, and once we moved back into the sea, we would stay there forever. But we Dolphin People did not move back into the sea for many thousands of years. We lived along the seashore of the Monocontinent as amphibians, half land creatures, half sea creatures. Living in huts along the seashore, we slept on land by night and lived in the sea by day. Then the Great Lomba was born unto us. Lomba was born of humble parents along the Sun Rise shore. It was soon obvious that Lomba was a great healer. 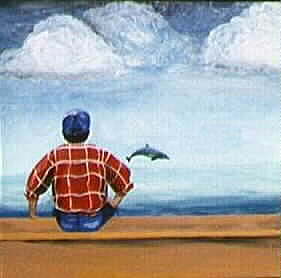 Lomba at a young age visited sick Dolphin People and healed them. He used his phonation apparatus in a way not used before. He created a vibratory field surrounding and filling the body of the sick one. Like thousands of tiny tuning forks vibrating at every point in the patient's body, the vibratory field restored the body to life, dissolving the illness, undoing the disease by its very presence. Lomba traveled up and down the Sun Rise coast, going as far as he could travel in the sea in a single day, as no one dared venture into the sea at night. Unable to see at night with our eyes, we left the sea for our land huts when the stars came out. Except for occasional romps during a full moon near the shore, the Dolphin People avoided the night-time sea. One day Lomba disappeared. Frantic calls went out for him up and down the Sun Rise coast, but no one could locate him. Weeks went by, then months, and slowly the realization hit the Dolphin People, "Lomba was dead." We were sure he had ventured out at night and been swallowed up by the demons of the night sea. The full moon excursions were canceled and we stayed on land at night. Several friends of Lomba began to minister to the sick using Lomba's techniques, invoking Lomba's memory as they did, and experienced some success doing so. Such was the power of Lomba's healing that merely intoning the name of Lomba brought relief to many. After three years, Lomba returned to his people. He was hailed as a savior and was thought by many to have returned from the dead. Thousands gathered to hear him speak of his adventures. "I have slept in the sea," Lomba began and a collective gasp went up from the gathered multitude, "and I have visited many foreign lands, including islands in the middle of the Great Sea inhabited by small, brown-skinned people. I have returned to tell you that the sea is safe for you to live in. We are the People of the Sea and we must realize our destiny now. Look about you on land - what do you have need of land except to sleep? Follow me now into the sea, leave all your worldly possessions that tie you to land, and join me in the freedom of the sea." This is how we Dolphin People first cast off our earthbound moorings and moved back into the sea. Lomba eventually said goodbye to his native people in the waters of the Sun Rise coast and led a band of young Dolphin People to the islands of the Brown Skinned People where he lived out the remainder of his days in peace and harmony.